Sunday Feb. 5 husband Walter and I dropped by Wendy’s to enjoy a baked potato, a low-sodium get-out-of-the-house treat for me, and a cheeseburger and fries for him. We encountered Mac and ImaJean Warth, a wonderful couple we attended church with years ago when our children and theirs were growing up. We haven’t been members of the same church for several decades, but we still catch up when we bump into each other. 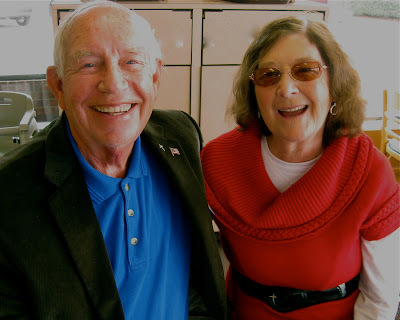 Sunday, however, was extra special, their 55th wedding anniversary. I had never before heard how they met, and their story delighted me. Twenty-one-year-old Mac was returning from a visit to his family’s home in Ohio. The bus trip to his military base took him through quite a few states. At one of the stops to pick up new passengers, a mother and her 18-year-old daughter boarded, and started looking for seats on the packed bus. They eased into the only two seats available. ImaJean, a high school senior, sat in the aisle seat next to Mac. Her mom sat across the aisle. The two were on their way to North Carolina to visit an aunt who was hospitalized with cancer. By the time the bus arrived at the ladies’ North Carolina destination, Mac was smitten. He made sure he had all the contact information he needed to stay in contact with ImaJean. Now in their 70s, they continue to work in the children’s department at their church. Mac smiles at the close of his story. “She’s God’s gift to me,” he said. What a sweet story!!! It is always so interesting to hear how married couples met, especially those who have been married for so long. So how did you and Walter meet? What a sweet story and so perfect for Valentines Day. PS for a one-handed typist you are doing quite well. You type with one hand? Incredible. I see no typos here. That story is one to be told to their grandkids over and over again, especially in these modern times.